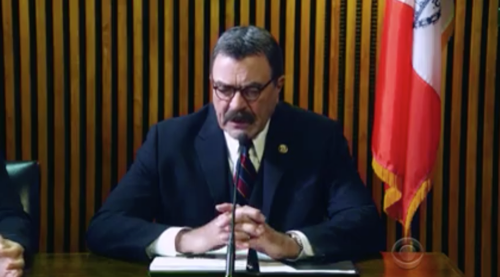 Tonight on CBS their hit drama starring Tom Selleck Blue Bloods airs with an all-new Friday, November 4, 2016, episode and we have your Blue Bloods recap below. On tonight’s Blue Blood Season 7 episode 7, Robert Lewis (Michael Imperioli) seeks Frank’s (Frank Reagan) public support of an investigation by the Attorney General; and Jamie (Will Estes) responds to an attempted suicide call. Did you watch last week’s Blue Blood episode 6 where as Frank contended with a whistleblower within the NYPD who claims to have evidence of abuse of power in the organization, Danny and Baez investigated the case of a woman who was struck by a car under suspicious circumstances? If you missed it we have a full and detailed Blue Blood recap, right here! Erin had problem a problem on her hands when a witness proved she could tank the case on her own without help from the defendant. The witness’s name was apparently Miranda Gibbs. Miranda had sworn that she had seen a known gangbanger fleeing the apartment of Mo William on the night he died and so he placed the defendant at the scene of the crime yet she was still problematic for the case. Miranda had also admitted, you see, to carrying around her own unlicensed weapon and that’s how she had recognized what the defendant had used because it looks like just hers. But that wasn’t something that Miranda could admit to in open court and so Erin had wanted to find someone that was just a little bit better. Erin had sent Anthony to look for any other witnesses that she could use and he had tried to help. Anthony had gone back to Miranda and Mo Williams’s neighborhood, however, no one was willing to speak to him and canvassing the area again only served to tick off Danny. Danny was the detective on the case and he felt that Erin showed have been enough with Miranda. He said that it took everything to convince Miranda to testify against a man like Diaz in her neighborhood. Yet, Erin had said that she would have liked to have used Miranda and that she couldn’t for whole sorts of reasons. With one of them being that Miranda hasn’t answered any of her calls since their initial interview. So Danny had said that he would look for Miranda. Danny had known the neighborhood well enough and so he had no problem with tracking down Miranda again because he thought that he had to fix whatever damage Anthony did by bulldozing over his case. However, Erin had wanted Danny to take Anthony with him and so she had kind of forced her brother’s hand. Danny didn’t like Anthony and he thought that Anthony was the reason why the case was suddenly falling apart. He said that Anthony wasn’t used to working the streets and that the other man had probably made Miranda rethink testifying seeing as he had been trying to look for other witnesses. So Danny had ultimately agreed to take Anthony though he didn’t think Anthony would be much help and he kindly wanted the other man to simply follow his lead. Danny’s lead however didn’t amount to much. Danny had done as his sister suggested when he had taken Anthony with him to go look for Miranda. Though there had been good news/bad news when they found her. The good news was that Miranda hadn’t disappeared and the bad news was that Miranda was found dead. She had apparently been killed by the same gun as Mo Williams and unfortunately neither Danny nor Anthony could pin her murder on Diaz. Diaz was still at Rikers when Miranda was killed. So the detectives had to find a way to connect Diaz to her murder and there only lead had been the other man. Miranda had said that Diaz had been with someone else on the night he killed Mo and that she didn’t see who. Anthony though had a pretty good idea where to look. Anthony had been told by both Danny and Biaz that they couldn’t find any video because the surveillance cameras had been out in the whole building so Anthony had decided to check the bodega across the street. He had seen that it had cameras in the front and so he had asked for the footage. But Anthony couldn’t be Anthony without rubbing it into Danny’s face that some detective from the DA’s office managed to find a video of Diaz running out of the building on the night he killed Mo. So Anthony got that one and his lead did pan out. The footage showed Diaz and a man with a distinctive baseball logo on his cap. And so he had tracked down their accomplice thank to that logo. Anthony found out that Diaz’s accomplice was Victor Mendez. Mendez had been the other man in the video, but he knew that the cops didn’t have much on him and that Diaz would beat the rap so he refused to tell them anything. Mendez didn’t answer their questions and he had also gotten a little lippy with Dany. So Danny didn’t allow the other man to leave until he felt like it which was just a little later than when Mendez originally wanted to leave. Yet, Danny and Anthony had found out that Mendez had gone to see Diaz right before Miranda was murdered so they tried taking that to Erin and she said that hadn’t been enough for a warrant. Erin had said that the vide proving they know each other simply meant they knew each other. And so the guys were going to need more. Erin couldn’t give them a warrant for Mendez’s place based on his mere association with Diaz so Anthony and Danny decided to investigate whether or not Mendez’s fingerprints matched the ones they found out at the crime scene. Mendez had never been arrested before so his fingerprints weren’t in the system yet luckily Danny had thought of the trash. Danny had remembered that Mendez doesn’t have jurisdiction over his own garbage after he puts out on the street and so Danny had sort of enlisted Anthony’s help in searching through the garbage. However, they ultimately found a beer bottle that Mendez used. So all they had to do was pressure Mendez into turning on Diaz and that wasn’t so hard to do. Diaz was the one with the hotshot lawyer and he had an alibi for Miranda’s death. So Diaz didn’t have to worry about staying in jail because Mendez had been right earlier. There wasn’t a chance that Diaz would get twenty-five to life for what he did meanwhile Mendez wasn’t going to be so lucky. The murder weapon had later been found in Mendez’s apartment and it had been his fingerprints at Mo’s apartment so he had been tied to two different crime scenes. Yet, what truly broke Mendez was the fact that he was still relatively new to the “life”. Mendez thought the cops were right when they said that he was going to go be fresh in prison and that no one would bother to think about him. And so he had caved. Mendez had agreed to testify and later he confessed in open court to everything that had happened. He had admitted that he had been with Diaz on the night Diaz killed Mo Williams because Mo was trying to stop the drug dealers in his neighborhood from peddling their junk around their kids. So Mendez had mentioned everything. He had said what Diaz did and hadn’t bothered to leave out that Diaz had asked him to kill Miranda to stop her from testifying. But what truly tied Diaz to the murders was when he threatened to kill Mendez in front of the judge and had needed to be carried out of court. And so Diaz was finally going to go away for what he did yet working the case together did help Danny and Anthony get over the fact that the only thing they agree on was how annoying Erin could be. Though it wasn’t just Erin and Danny that had had it rough. Jamie also had a difficult day on the job when the man he had saved from killing himself went on to murder his cheating girlfriend. So Jamie had tried to blame himself for what happened however his brother Danny had reminded him that there was always going to be days when they lose someone and that’s going to stick with you. Only Danny had said that there will come time when the wins outweigh the losses and he had asked his brother to reach out if he ever felt that losses were outweighing the wins. And so Danny had helped Jamie from blaming himself for what happened to the jumper he saved and shockingly the bothers had even been on the same page when it came to their dad. Frank had been asked by the Attorney General to comply with an investigation into NYPD’s use of firearms and he had done so yet Robert Lewis had made it out to seem as if Frank personally agreed that his department had a problem with shootings in minority neighborhoods. So Frank had seen how that affected his sons and he also hadn’t liked that there were other officers that felt he sold them out. But Frank got Robert back in the end. He had gone to the press conference with Robert and there he had said that the police shootings in New York were at their lowest in the last fifty years. And so in retaliation, Robert had the courtesy of later telling Frank that the investigation would now be demanding everything. Statics on how many times a cop deployed their weapon, chain of evidence, and practically all of their case files are going to be reviewed.